Blizzard Entertainment today revealed plans for an explosive new addition to Hearthstone®: Heroes of Warcraft®—Goblins vs Gnomes™! Announced at the company’s eighth BlizzCon® gaming convention, Goblins vs Gnomes is the first expansion for the game and will introduce over 120 new goblin- and gnome-infused cards for players to add to their collections. 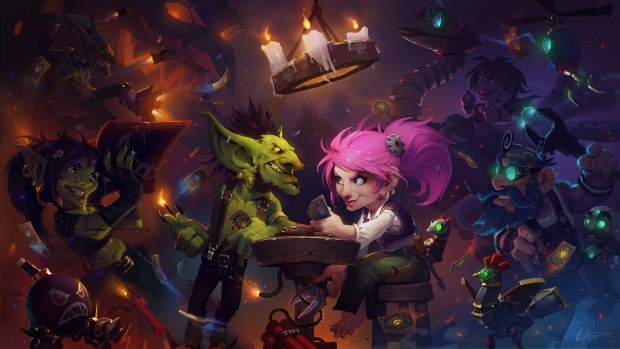 Goblins vs Gnomes immerses Hearthstone players in an epic rivalry between goblin engineers and their gnomish counterparts. Though wildly brilliant, these pint-size tinkerers don’t always have the upper hand on the mechanical contraptions they create, and the results can be wonderfully unpredictable. The new cards coming in the expansion are filled with wild and wacky inventions as well as some faces that will be familiar to World of Warcraft® and Hearthstone players. Coming this December to PC and iPad®, Goblins vs Gnomes card packs will be winnable in the game’s Arena mode and purchasable with in-game gold or real-money. Specific details on pricing and launch timing will be announced in the weeks ahead. To take a peek at the latest schematics and read up on all things Goblins vs Gnomes for Windows, Mac, and iPad, visit www.playhearthstone.com. ChangYou has announced the official launch for open beta of its card game, Sword Girls. Bless Online announced that on January 9th, a new update is coming to the MMORPG, and with it come Sapiens Mausoleum (Elite).